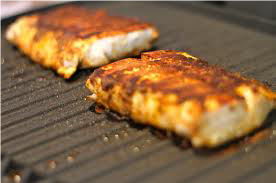 Preheat grill, place fish on grilling rack. Squeeze ½ lemon over fish, sprinkle with curry seasoning. Place tomato slices on top of fish, grill until tomato starts to brown and fish is cooked (approximately 10 – 15 minutes). This includes both your meat and vegetable for this meal.